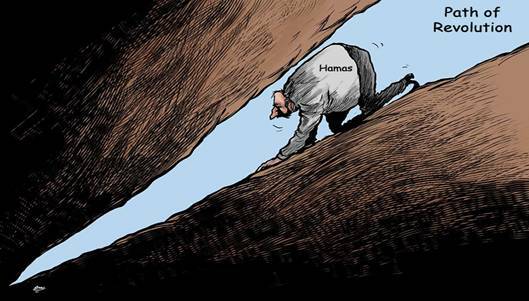 Numerous cartoons recently published in the Arab press dealt with the Hamas takeover of Gaza. 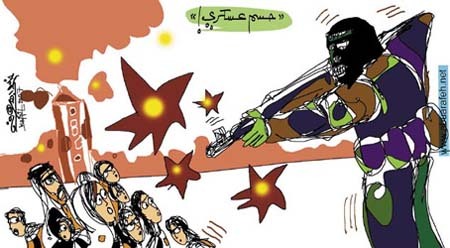 Some of the cartoons condemned the brutal murders perpetrated by Hamas, implied that they have led the movement, as well as the Palestinian cause, to a dead end, and presented the fighting among the Palestinians as shocking and pointless. 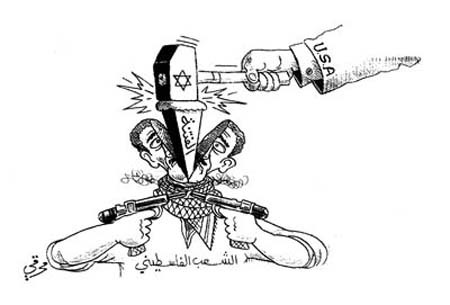 Others presented the civil war as the result of an American-Israeli plot carried out with the collaboration of Fatah. 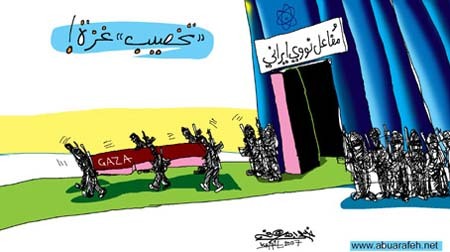 And one cartoon even depicted Gaza as an Iranian nuclear outpost. Cartoon No. 1: The masked fighter is saying "the government is illegitimate." 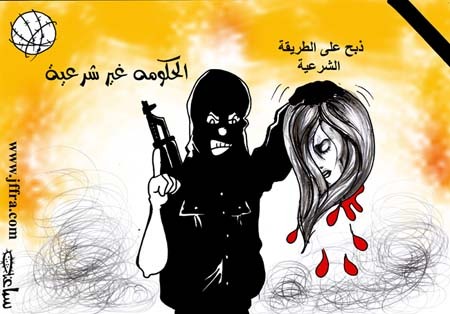 The caption above the severed head is deliberately ambiguous, and can be interpreted as meaning either "legitimate butchery" or "butchery according to Islamic law," the latter hinting at Hamas. Source: Al-Hayat Al-Jadida (Palestinian Authority), June 18, 2007. Cartoon No. 2: The sign says "Gaza"
Source: Al-Dustour (Jordan), June 17, 2007. Cartoon No. 3: "Decisive military solution [to the internal Palestinian conflict]"
Source: Al-Quds (Jerusalem), June 14, 2007. Cartoon No. 4: The figure of the surgeon is labeled "the emergency government;" the figure of the warrior is labeled "government of disasters." 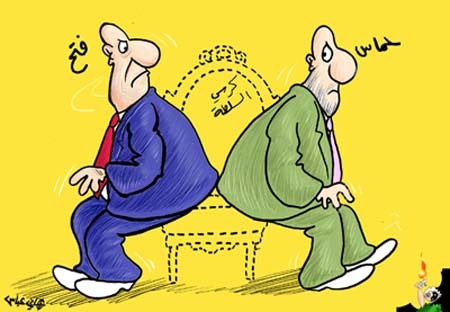 Source: Al-Mustaqbal (Lebanon), June 19, 2007. Cartoon No. 5: "The Light at the End of the Palestinian Tunnel"
Source: Al-Dustour (Jordan), June 21, 2007. Cartoon No. 6: The banner behind the figures says "With our souls and blood we will redeem thee, oh Palestine." 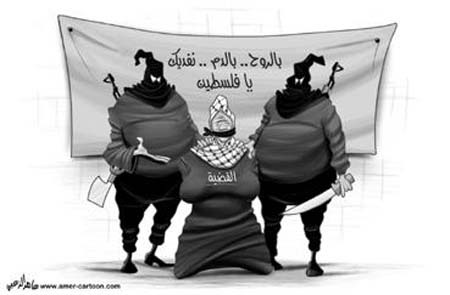 The female figure in the center is labeled "The [Palestinian] cause." 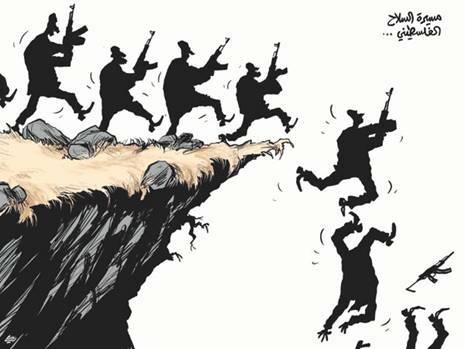 Source: Al-Watan (Qatar), June 14, 2007. Cartoon No. 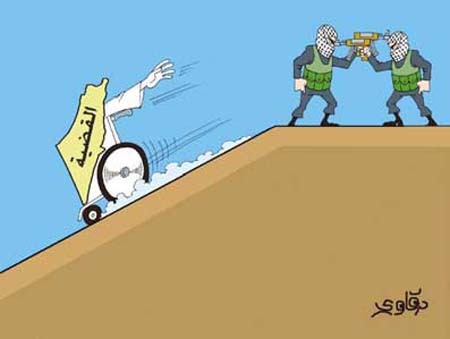 7: The cart rolling down the slope is labeled "the Palestinian cause." Sources: Al-Dustour (Jordan), June 18, 2007; Al-Quds (Jerusalem), June 20, 2007. Cartoon No. 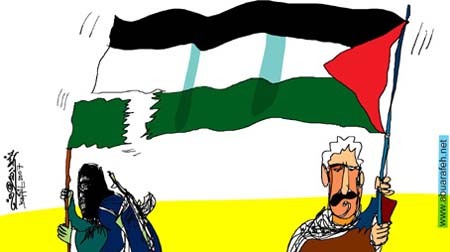 8: "The Abduction of Gaza"
Source: Al-Ayyam (PA), June 18, 2007. Source: Al-Quds (Jerusalem), June 16, 2007. 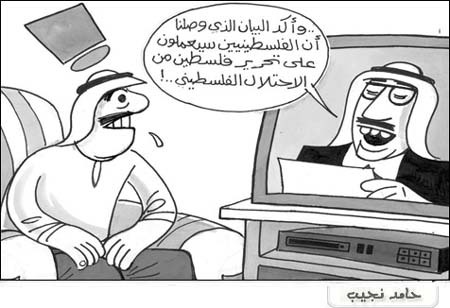 Source: Al-Yawm (Saudi Arabia), June 17, 2007. Sources: Al-Sharq Al-Awsat (London), June 22, 2007; Arab News (Saudi Arabia), June 22, 2007. Cartoon No. 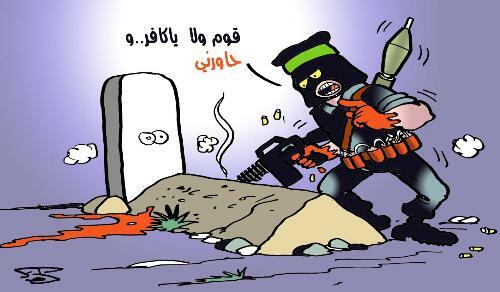 12: The Hamas member says to the Fatah member in the grave: "Wake up, infidel, and negotiate with me." 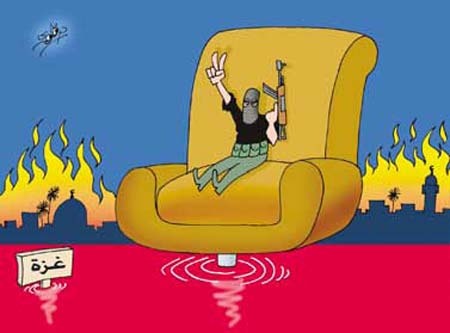 Source: Al-Ayyam (PA), June 21, 2007. Cartoon No. 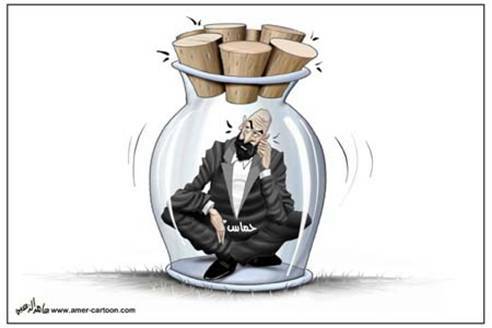 13: The figure in the jar is labeled "Hamas." Source: Akhbar Al-Arab (UAE), June 24, 2007. Cartoon No. 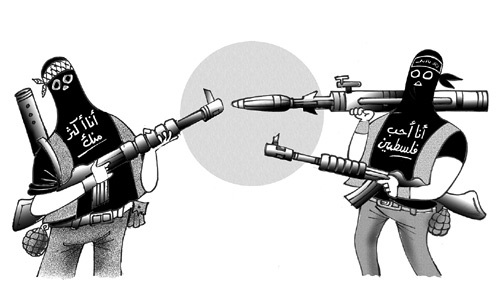 14: "Procession of Palestinian Gun[men]"
Source: Al-Sharq Al-Awsat (London), June 19, 2007. Cartoon No. 15: The top picture is labeled "Children's game yesterday – to our pride." 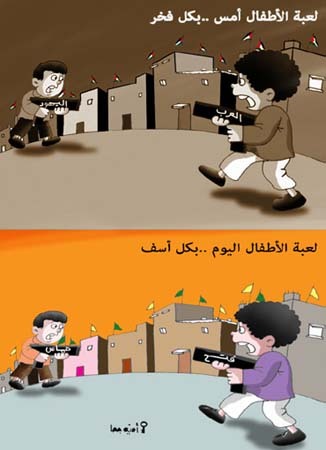 In this picture, the gun held by one child is labeled "the Arabs," and the gun held by the other is labeled "the Jews." The bottom picture is labeled "Children's game today – to our shame". In this picture, the gun held by one child is labeled "Fatah," and the gun held by the other is labeled "Hamas." Source: Al-Raya (Qatar), June 20, 2007. Cartoon No. 16: The shirt of the figure on the right says "I Love Palestine"; the shirt of the figure on the left says "I [love it] more." 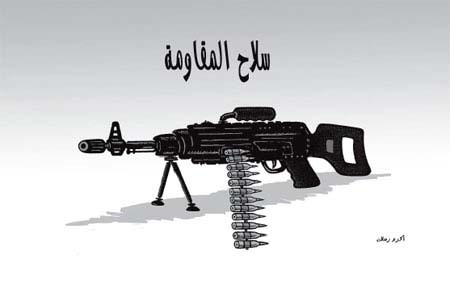 Source: Akhbar Al-Khalij (Bahrain), June 12, 2007. Cartoon No. 17: The imaginary chair is labeled "the seat of government." 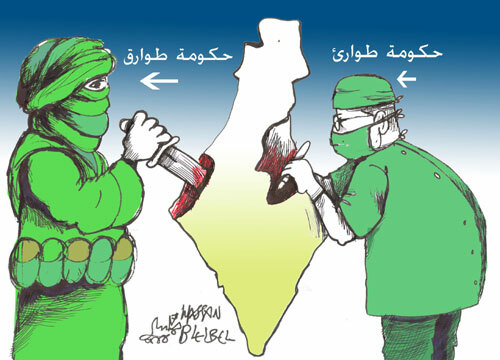 The figure on the right is labeled "Hamas" and the one on the left is labeled "Fatah." Source: Oman (Oman), June 17, 2007. Cartoon No. 18: The TV announcer says: "the bulletin that reached us states that the Palestinians will attempt to liberate Palestine from the Palestinian occupation!" Source: Al-Ittihad (UAE), June 16, 2007. Cartoon No. 19: The horned figures are labeled "Fatah" and "Hamas." Source: Al-Watan (Qatar), June 19, 2007. Cartoon No. 20: Mahmoud Abbas, uttering Bush's words, is saying "No to dialogue with Hamas." Source: Akhbar Al-Khalij (Bahrain), June 22, 2007. Cartoon No. 21: The stake is labeled "the internal war"; the figure's shirt says "the Palestinian people." Source: Akhbar Al-Khalij (Bahrain), June 18, 2007. Cartoon No. 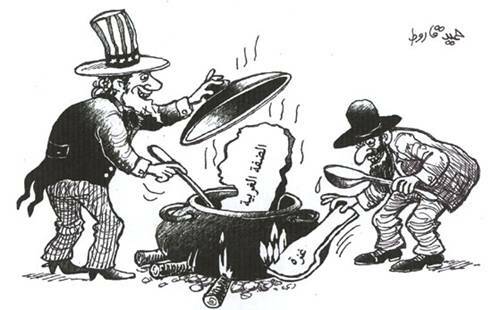 22: "The American Recipe for Creative Chaos"
Source: Al-Ghad (Jordan), June 17, 2007. Cartoon No. 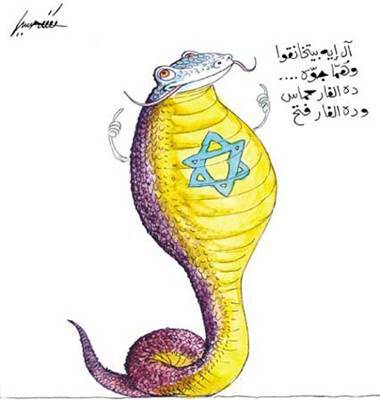 23: The snake, representing Israel, is saying "Think how they must be fighting each other in there." 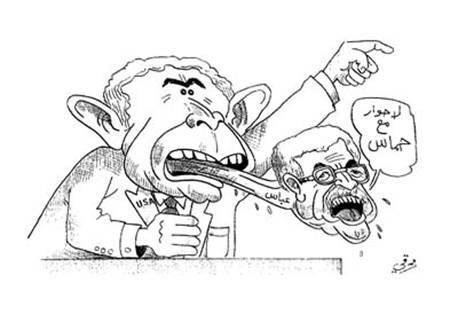 The two mice in his mouth represent Fatah and Hamas. 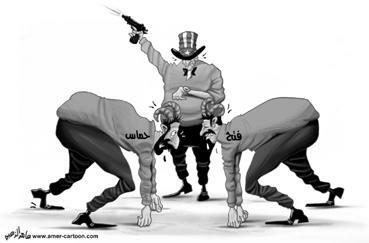 Source: Akhbar Al-Yawm (Egypt), June 20, 2007. Cartoon No. 24: The newspaper headline says "The Internal Palestinian Conflict." The Jew holding the paper is laughing "ha ha ha." 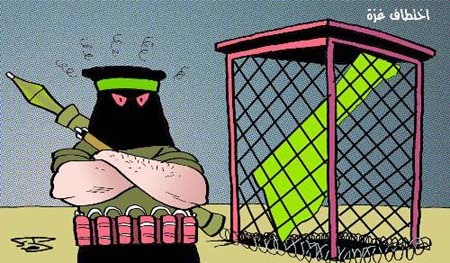 Source: Al-Watan (Qatar), June 17, 2007. Cartoon No. 25: The (ready) Gaza-shaped piece of meat outside the pot is labeled "Gaza," and the piece still cooking inside the pot is labeled "the West Bank." Source: Teshreen (Syria), June 25, 2007. Cartoon No. 26: The caption reads "The Enrichment of Gaza." The sign over the doorpost: "Iranian nuclear reactor." 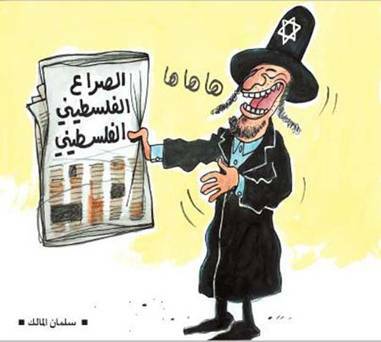 Source: Al-Quds (PA), June 25, 2007. * O. Winter and E. Glass are Research Fellows at MEMRI.